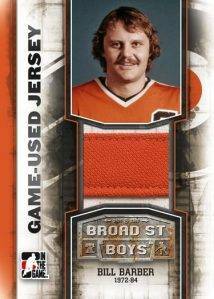 One of the NHL's most successful Expansion Era franchises, the Philadelphia Flyers have a storied history filled with memorable moments and Hall of Fame superstars. 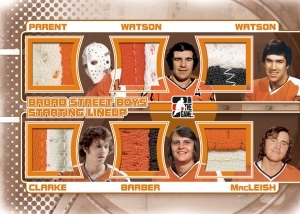 Now they're the subject of their own set of hockey cards. 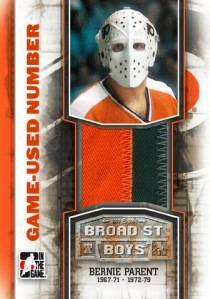 2011-12 In the Game Broad Street Boys is the latest set from the company to target a niche market while still offering compelling content that should appeal to a wider collecting crowd. 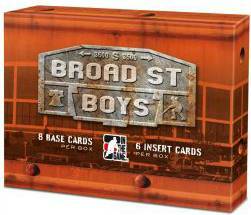 Boasting eight base cards and six hits, boxes pack a lot of value considering their mid-range price. In the Game also promises a very limited print run. The only inserts in the set are either autographs or game-used memorabilia cards. Like the base set, players in these sets span the team's storied history. 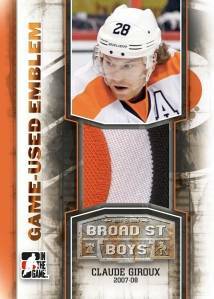 Collectors can expect hits from Bobby Clarke, Bill Barber, Ron Hextall, Daniel Briere, Claude Giroux, Jaromir Jagr, Peter Forsberg and many more. Autographs come in two versions: Black and Orange. 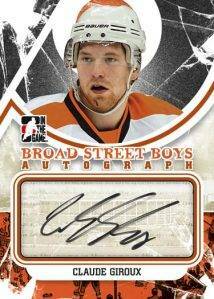 Each is noted by the colored outline around the cropped logo in the autograph's background. Basic game-used memorabilia cards include Game-Used Jersey, Game-Used Emblem and Game-Used Number. 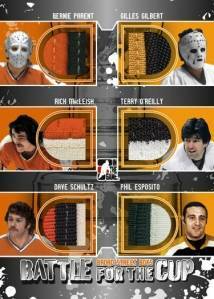 Collectors can also look for numerous multi-swatch cards. Starting Lineup cards use pieces from the first-line players from notable teams. Battle for the Cup mixes three Flyers pieces with three from their postseason opponents. Stickwork inserts use three game-used stick pieces showcased in large windows that spell 'PHL.' 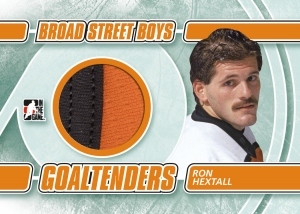 Other game-used inserts include Quad Memorabilia, Tough Materials and Goaltenders. 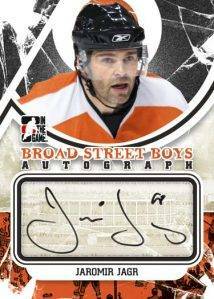 11-12 ITG BROAD STREET BOYS AUTOGRAPH ORANGE VERSION BOB DAILEY 10 #A-BD SP! !